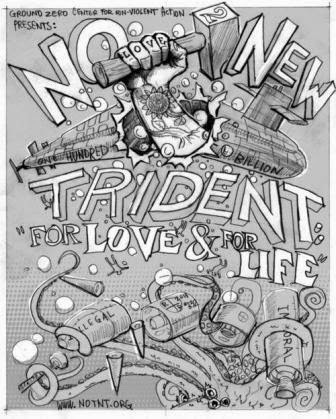 NO To NEW TRIDENT - For LOVE & For LIFE: Trident is "an accident waiting to happen"
Trident is "an accident waiting to happen"
Eric Schlosser, who will talk about his new book on nuclear weapons in Seattle on October 1st, published a provocative article in The Guardian just the other day. The public debate about Britain's Trident submarines and their missiles has focused mainly on the long-term costs and economic benefits of replacing them, the number of jobs that might be gained or lost, the necessity of round-the-clock patrols. Some fundamental questions have been largely absent from the discussion. How would this cold war missile, due to remain in service for another 30 years, actually be used in a 21st-century conflict? What targets would it destroy and in what circumstances? Whom is it supposed to kill? Finally, and perhaps most importantly, do the British people face a greater chance of being harmed by their own nuclear weapons, through an accident or a mistake, than by a surprise attack? The safety of the Trident D5 missile has long been a source of concern. In December 1990, the Panel on Nuclear Weapons Safety, a group of eminent physicists appointed by the US Congress, warned that its unusual design posed significant risks. To save space, the multiple warheads weren't mounted on top of the missile; they surrounded its third-stage rocket engine. And the "high-energy" class 1.1 propellant used in that rocket engine was far more likely than other propellants to explode in an accident. "The safety issue of concern here," the panel found, "is whether an accident during handling of an operational missile – viz, transporting and loading – might detonate the propellant which in turn could cause the HE [high explosives] in the warhead to detonate, leading to dispersal of plutonium, or even the initiation of a nuclear yield." The decision to use the more energetic rocket fuel and the more unstable high explosive was made during the early 1980s, to increase the range of the Trident D5 missile and decrease the weight of its warheads. The first British Trident submarine went on patrol four years after these safety risks were discovered, and the Trident D5 missile is supposed to remain in service until 2042. The risk of explosion and plutonium dispersal is greatest when the warheads are being loaded on to the sub, unloaded from the sub, or transported by road between Scotland and the Atomic Weapons Establishment in Aldermaston, Berkshire. Glen Milner of Ground Zero Center for Nonviolent Action in Poulsbo, Washington has attempted to focus the public's attention on the risks of Trident for many years. "Milner has extensively researched the rocket propellant used in the D5 and has spoken out publicly on its risks. He was cited in a Crosscut.com article earlier this year about the Navy's plan to double its missile handling capacity at its Bangor Trident submarine base on Hood Canal in Washington State. 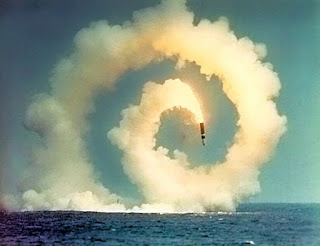 That same article cited a 1986 accident involving Trident rocket motors. More recently at the Bangor submarine base (November 2003) "a ladder left inside a submarine's missile tube punctured a missile's nose cone and came within inches of a nuclear warhead." (source: Kitsap Sun newspaper) A close call indeed. The construction of a Second Explosives Handling Wharf near the existing wharf greatly increases the probability of a major disaster should there be an accidental detonation at one wharf if two submarines are being simultaneously loaded/unloaded. The public (in both the UK and US) should be concerned, and indeed outraged, that any (token) public discussion is NOT engaging the truly important questions about why (in the US) we should spend nearly $100 billion - and some consider this a conservative estimate - just to build twelve new Trident submarines. Beyond the very real risks of accidents, Trident is an archaic Cold War first-strike weapons system that just doesn't seem to want to go down without a fight. Speaking of "fighting", just (to use Schlosser's questions) How would this cold war missile, due to remain in service for another 30 years, actually be used in a 21st-century conflict? What targets would it destroy and in what circumstances? Whom is it supposed to kill? Questions, questions, questions... Any answers??? Editor's Note: Eric Schlosser will talk about his most recent book, Command and Control Nuclear Weapons, the Damascus Accident, and the Illusion of Safety, at the Seattle Public Library on Tuesday, October 1st at 7:00 PM. There will be a meditation in preparation for the event at 6:25 PM just outside the library, sponsored by the Buddhist Peace Fellowship, Seattle Chapter. More information by clicking here. Watch a YouTube video of Schlosser at the New America Foundation. In the Q&A period he speaks directly to the weakness in the design of the Trident II D-5 missile relating to the warheads encircling the third stage rocket motor containing very high energy "sensitive" propellant. Skip ahead to approximately the 52 minute mark to catch this reference.